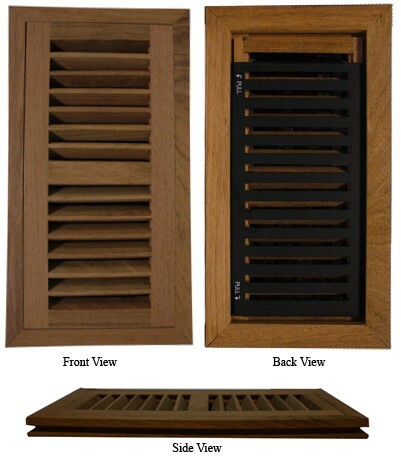 This high output flush mount vent will distribute your air 30% more than other wood registers. Our Brazilian Cherry floor register cover is made with a sliding steel damper that lies flat under the insert. The insert on this flush mount vent cover can easily be removed for cleaning or replacement purposes. These floor register covers are made in the US and are crafted to be 3/4" thick. The entire flush mount vent is left unfinished so that the floor register cover can be stained along with your new hardwood floor. When purchasing the floor register covers, please note that they can only be installed with new floors. The reason flush mount vents need to be installed at the same time is because there is a tongue and groove locking system that clicks the register into place. *Call us to ask about special ordering other thicknesses. Tip: These floor register covers can be ordered by measuring your floor opening and matching to the nearest sized vent. These flush mounts are not meant for already installed floors. Check out our wide selection of flush mount vents in other wood species and drop in wood floor register covers for already installed floors. Our flush mount vents are the best choice when looking for an excellent and affordable wood register. Order them today!